Victory at Casablanca, Oran, and Algiers gave the United States Army and its British ally solid toeholds in the western Mediterranean Theater of Operations. But it offered no guarantee of easy access to Italy or southern Europe, or even to the eastern end of the Mediterranean, where the British desperately needed assistance to secure Egypt and strategic resources in the Near East. The sudden entrance of American forces during 8-11 November 1942 created an awkward deployment in which two pairs of opposing armies fought in North Africa, one in Tunisia, the other in Libya. Neither Axis nor Allies found any satisfaction in the situation; much fighting remained before either adversary could consider North Africa secure. Even before the fighting in northwest Africa ended, intense negotiations between American and French officials began. On the morning of 10 November in Algiers Lt. Gen. Mark W. Clark, deputy to Lt. Gen. Dwight D. Eisenhower, Commander in Chief, Allied Force, met Admiral Jean Francois Darlan, commander in chief of the collaborationist Vichy government's military forces. The different motives and needs of the two sides made these sessions difficult for all. The Allies were in a hurry to gain French help in fighting the Germans and Italians before the Axis could reinforce its units in Africa. On the same day talks in Algiers opened, British Lt. Gen. Kenneth A. N. Anderson began moving his Eastern Task Force into position off Tunisia for the next series of landings. With Clark and Darlan still in the early stages of negotiations, the enemy acted. On 11-12 November German submarines fired several near-misses at the American aircraft carrier Ranger, scored hits against three ships, and sank three transports off Casablanca. Intelligence sources reported Axis aircraft and transports en route to Tunis. Meanwhile, across the negotiating table General Clark found a frustrating lack of urgency in his French counterparts. sovereignty on the other. When Operation TORCH began, German and Italian units crossed Vichy borders to complete the conquest of France begun over two years before. In response, the French fired on Axis units in Tunisia, which only brought closer Nazi supervision at Vichy. At Algiers Admiral Darlan thus found himself performing a delicate balancing act. As a member of the Vichy government he could not simply turn over French forces in North Africa to the Allies. But he also refused even to deal with his subordinate commanders in North Africa whom he suspected of pro-Allied sympathies. And, to the exasperation of the Allies, Darlan's cease-fire order to the Oran and Casablanca garrisons was countermanded by officials in Vichy. 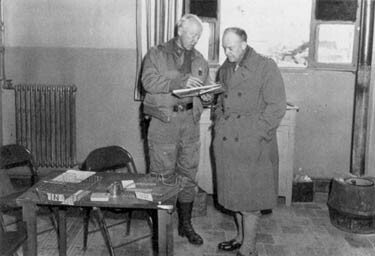 Generals Clark and Eisenhower saw no alternative to continuing reinforcement while the talks went on. On the day a cease-fire went into effect in Morocco and Algeria, 124,760 Allied troops were ashore, and dozens of transports were steaming toward Casablanca, Oran, and Algiers. By the end of November the Allies would have 253,213 troops in North Africa. The Axis buildup began at an equally frenzied pace. As early as 10 November the Italian Air Force sent to Tunis a flight of 28 fighters. 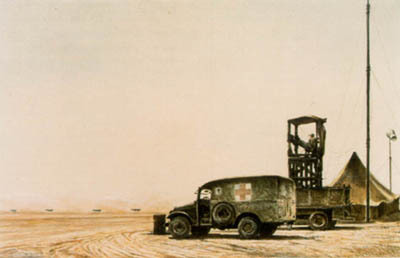 Two days later an airlift began that would bring to Tunisia over 15,000 men and 581 tons of supplies. During November transports brought to the ports of Tunis and Bizerte 176 tanks, 131 artillery pieces, 1,152 vehicles, and 13,000 tons of supplies. 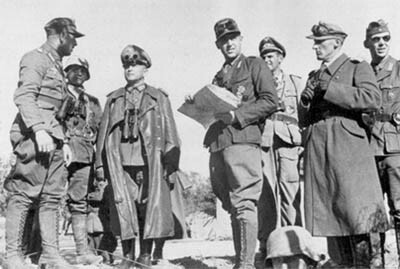 To strengthen Axis units already in North Africa, the Germans sent three fresh divisions, the Italians two. Due to limited Allied naval capability, Axis submarines could attack Allied ships in waters between Sicily and Tunisia with little worry about Allied antisubmarine retaliation. The longer Darlan delayed committing to the Allies, the more costly the ensuing battle would become. Finally, on 13 November, Clark and Darlan reached a workable agreement. The Allies gained their major objective: French forces in North Africa would immediately assist American and British forces in liberating Tunisia and, later, metropolitan France. Political fragmentation in the French armed forces was for the moment subordinated to the common purpose of defeating Axis armies. General Eisenhower quickly cabled his approval of the Clark-Darlan agreement, and Allied field commanders added French units to their operational plans. reached with an official they considered a traitor. Civilian reaction as well dampened official enthusiasm. Public opinion in the United States and Britain did not welcome the news that Allied governments had negotiated with Darlan, who shared an extremely negative reputation with Vidkun Quisling, the Norwegian Army officer who had facilitated the surrender of his own country to Hitler's armies. With both President Franklin D. Roosevelt and Prime Minister Winston S. Churchill speaking of the need to accept a "temporary expedient" with Darlan, the issue was contained, but Allied planning proceeded in an atmosphere of some uncertainty. To liberate Tunisia from Axis influence, the Allies would have to conduct operations whose character was entirely different from those at Casablanca, Oran, and Algiers. The Allies had entered northwest Africa by executing simultaneous amphibious operations at separate points. But in Tunisia Axis air power based in Sicily would make an amphibious assault risky, necessitating an overland advance from Algeria, the only route that provided a secure base of support. Major Allied objectives were the port cities of Bizerte and Tunis, only forty miles apart. In Tunisia the United States Army for the first time had to operate far inland on the African continent. The task brought Americans into terrain much different from what they had found in Morocco and Algeria. Some 400 miles east of Algiers, Tunisia enclosed a much smaller area, stretching only 160 miles from east to west and 500 miles from north to south. Hills and mountains in the north leveled to sandy expanses in the south, the northern reaches of the Sahara Desert. With the northern coast of Tunisia obviously accessible to the Axis, most combat would be there. The port cities of Bizerte and Tunis lay on separated coastal flatlands interrupted by lakes and marshes and surrounded by hill masses extending from higher ranges to the west. Half-a-dozen rivers radiated west and southwest of the two ports. Because these rivers afforded the best routes through the mountains, the most heavily traveled roads and rail lines ran along their banks. With their hubs of radiating roads and rail lines, the towns of Mateur and Djedeida, in different valleys, were obvious intermediate objectives. Possession of Mateur opened a path to Bizerte, only twenty-two miles away, while control of Djedeida left only a thirteen-mile run to Tunis. A dry climate left the flatlands hard from March to November, ideal for mechanized and armored operations and for airfield construction. While General Clark negotiated with Admiral Darlan in Algiers, the Axis continued pushing reinforcements across North Africa. By mid-November about 15,000 German and 9,000 Italian troops manned two beachheads radiating between five and ten miles from Bizerte and Tunis, and patrols were extending their perimeters. French and Italian crews manned coastal batteries around the two ports. Uncertain of the response of French troops in the area to an Allied attack, the Germans placed a civil-military detachment in the two cities to neutralize civilians and continued efforts to win over local French commanders. Of great concern to Allied leaders was the strong Axis air force in the area. Five groups of fighters and a group of dive bombers had recently transferred to Tunisian airfields. General Walther Nehring, commanding general of the German XC Corps, directed Axis units in Tunisia, while Field Marshal Albert Kesselring, Commander in Chief, South, controlled Axis operations in both Tunisia and Tripolitania, the western region of Libya. about its surrender. In support of these ground operations, naval and air units were to cut the Axis supply pipeline from Sicily. D-day was set for 25 November. Allied ground forces would be mostly British- one infantry division and one armored division supported by several American units, none larger than a battalion-and commanded by British General Anderson. General Eisenhower planned to keep adding British and American units until each ally fielded a full-strength corps. 1st Battalion, 1st Armored Regiment, advanced with Blade Force; and four American units supported the 11th Group: the Reconnaissance/Intelligence platoon and the 2d Battalion (less Company E) of the 13th Armored Regiment, the 175th Field Artillery Battalion, and Company C of the 701st Tank Destroyer Battalion. Anxious to push east before Axis forces became any stronger, Evelegh began moving his troops into jump-off positions on 16 November. The next day a British unit guarding a bridge and highway intersection at Djebel Abiod, on the route soon to be used by the 36th Infantry Brigade Group, clashed with a German-Italian armored column moving west. 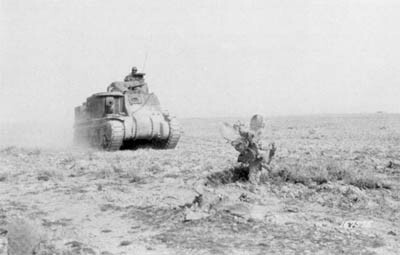 In a three-hour fight, the first of the Tunisia Campaign, the Allies lost more men than the Axis but drove the enemy back toward Bizerte with a loss of eight tanks. For the next week similar encounters occurred at several sites as both sides tried to determine the location of each other's forward elements and to break up concentrations of men and equipment that could evolve into attack spearheads. Despite these actions and German air raids on Allied positions as far west as Algiers, Evelegh had his three brigades in position by 24 November. The Allied attack began the night of 24-25 November when the 11th Infantry Brigade Group troops set out on the southern axis toward Medjez el Bab under bright moonlight. They were soon stopped by heavy fire and in daylight driven back with many casualties. A second element of the brigade was also stopped while approaching the town from another direction. To the Allies' surprise, however, the Germans withdrew the night of 25-26 November; after an artillery preparation, the troops walked into Medjez el Bab unopposed. Quickly moving east, the 11th Group took the town of Tebourba in the early hours of the 27th. The Germans fought the rest of the day but withdrew to Djedeida. In the center Blade Force jumped off at 0700 on the 25th when more than one hundred British and American tanks rumbled east into a dusty sunrise. Within a few hours the 1st Battalion, 1st Armored Regiment, began meeting and pushing through light resistance from enemy reconnaissance patrols. The next day the first American-German tank battle of the war developed at the Chouigui Pass north of Tebourba. Skillfully coordinating infantry, antitank, and tank forces, the Americans knocked out seven German tanks and drove off enemy ground troops at a cost of six tanks. moving the night of 25-26 November, the brigade advanced for two days without even seeing the enemy. augmented by four new 88-mm. Mark VI Tiger tanks in their first field test, at Djedeida, thirteen miles west of Tunis. Enemy antitank and artillery fire stopped the brigade with a loss of five tanks. An Allied attempt to reinforce overnight only brought more frustration. The U.S. 5th Field Artillery Battalion, recently arrived from Oran, ran into an ambush and lost its command group. The next day both the 36th and 11th Groups renewed their attacks, and again they were stopped. Special operations in support of these attacks proved ineffective. An amphibious landing of British and American infantry to assist the drive on Bizerte found no friendly troops to join because the 36th Infantry Brigade Group had been stopped miles west of the rendezvous point. The battalion-size unit ran out of supplies and withdrew with casualties. A parachute drop of 500 British troops twentyfive miles south of Tunis cut a few Axis phone lines, but the men had to make their way back to Medjez el Bab, harried by the enemy. Their losses were 19 killed, 4 wounded' and 266 missing. By nightfall on the 30th the Allies were stopped everywhere. had time for only one planned daylight mission from more distant fields. The Atlas Mountains also created a weather difference that worked against the Allies in the early months of the campaign. Axis pilots enjoyed more clear days east of the mountains, while Allied pilots west of the range lost many days to rain. These conditions meant that Axis squadrons had the time and weather to react to targets of opportunity such as armor columns and infantry concentrations, while Allied air units had to be content to bomb fixed targets such as airfields and supply areas. Kesselring and Nehring allowed their bloodied adversaries no rest. Early on the morning of 1 December a strong counterattack came out of Djedeida. In two columns spearheaded by forty tanks and supported by deadly dive bombers, the German-Italian attackers hit Blade Force, sending its units into a hasty withdrawal south. The road quickly became congested with vehicles of all types, which only made a more inviting target for enemy artillery and dive bombers. In the first four days of December the Germans and their Italian allies built up momentum and pushed the Allies back from Djedeida, securing it as an Axis strongpoint, then farther west to take Tebourba. After a brief pause the Germans resumed their offensive, taking Djebel el Guessa, a key hill mass four miles south of Tebourba, and in the process mauling elements of the U.S. 6th Armored Infantry Regiment. 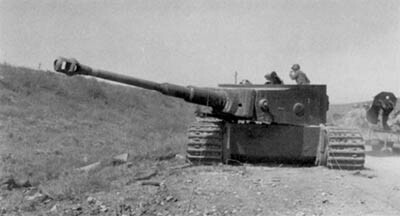 Still the German tanks and dive bombers came and for the next four days pushed the Allies farther west. Finally on the 10th, Allied units held a defensive line just east of Medjez el Bab. The string of defeats in December cost them dearly: over 1,000 missing (prisoners of war), and 73 tanks, 432 other vehicles, and 70 artillery pieces lost. Frustrated and furious, Eisenhower wrote a scathing description of Allied performance in the Tunisia Campaign. To Chief of Staff General George C. Marshall he confided his view that American and British operations had thus far managed to violate every accepted tactical principle of warfare and would be condemned in the military school system for decades to come. Despite the string of defeats, General Anderson aimed another attack at Tunis, this one scheduled for 22 December. The continued but slow buildup had brought Allied force levels up to a total of 20,000 British, 11,800 American, and 7,000 French troops. A hasty intelligence review showed about 25,000 combat and 10,000 service troops, mostly German, across their line of departure. Allied commanders hoped that a quick strike and numerical superiority would offset Axis air support and the increasingly heavy rains which had begun to affect Allied mobility. The first contact seemed to justify such hopes. On the night of 16-17 December a company of the U.S. 26th Regimental Combat Team (RCT), 1st Infantry Division, made a successful raid on Maknassy, 155 miles south of Tunis, and took twenty-one Italian prisoners. The main attack began the afternoon of 22 December and pointed toward continued success. Despite rain and insufficient air cover, the U.S. 18th Regimental Combat Team and British Coldstream Guards made good progress up the lower ridges of the 900-foot Longstop Hill that controlled a river corridor to Tunis. But two days later a German counterattack stopped the advance, and by the 26th the Allies had withdrawn with heavy losses to the line they had set two weeks earlier. Without gaining even their preliminary objective the Allies had taken 534 casualties. Free French government was questionable, and the issue of French reliability arose all over again in Allied command bunkers and foxholes. General Eisenhower found nothing to celebrate over Christmas 1942. He and his subordinate commanders concluded that their string of defeats could be ended only by making major changes in the way they were fighting Axis armies. They would have to do more than simply replace personnel and equipment losses and try another dash to Tunis. They would have to build a multi-division force with hundreds of tanks and much stronger air support, and they would have to coordinate pressure against the Axis on a front hundreds of miles long. They would also have to wait for the weather to clear. These preparations required a minimum of two months. With the Allies still trying to carry out a quick thrust to Tunis in December, the shape of the opposing orders of battle that would decide the outcome of the Tunisia Campaign could already be discerned. 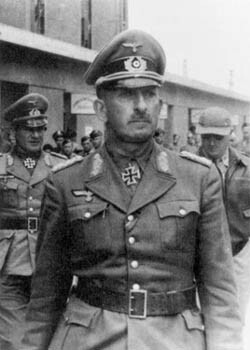 Kesselring was bringing up to full strength General Juergen von Arnim's Fifth Panzer Army, successor headquarters to Nehring's XC Corps, consisting of the Division von Broich, a heavily armored unit in the Bizerte area, the 10th Panzer Division in the center before Tunis, and the Italian Superga Division on the southern flank. On the opposite side, Eisenhower transferred units from Morocco and Algeria eastward into Tunisia, bringing in fresh troops as fast as they could be prepared. On the north, Anderson's Eastern Task Force would become the five-division British First Army, with three more divisions soon joining the 6th Armoured and 78th Infantry Divisions already in Tunisia. On the south the basis of a two-division anti-Nazi French corps was being laid. In the center Eisenhower planned a full American corps, to be commanded by Maj. Gen. Lloyd R. Fredendall. With regiments from Algeria and Morocco, the U.S. II Corps would eventually include the larger part of six divisions: the 1st, 3d, 9th, and 34th Infantry and the 1st and 2d Armored. The stage of conflict shifted south in January 1943. As the British Eighth Army pushed the German-Italian Panzer Army west across Libya, General Field Marshal Erwin Rommel sent staff officers to the port of Sfax, 150 miles south of Tunis, to prepare for a juncture of Axis forces in Tunisia and Libya. The possibility of a Rommel-von Arnim link-up greatly concerned Allied planners because these combined armies could sweep westward into Algeria and Morocco, where the Allies held only coastal enclaves. To head off this threat Eisenhower subordinated capture of the Bizerte-Tunis bridgehead to operations in central and southern Tunisia. While both sides waited for better weather they also grew stronger. With a dominant naval presence in the western Mediterranean and large garrisons in Morocco and Algeria, the Allies had little difficulty continuing their buildup in Tunisia. But the amount of Axis troops and supplies that infiltrated by sea and air from Italy was frustrating. From the surrender of Algiers in mid-November through January 112,000 men and 101,000 tons of supplies and equipment arrived in Tunisia to join enemy forces already there. have to move through the passes; to prevent the linkup, the Allies would have to block them. In late December and mid-January the French took important gaps in the mountains near Ousseltia, but in a retaliatory strike the Germans inflicted over three hundred casualties. A more serious challenge developed in late January when Axis units attacked at the juncture of the British and French sectors and pushed the line ten miles west. The French took the brunt of this assault, losing 21 tanks, 52 artillery pieces, and over 200 vehicles as well as 3,500 troops missing. The American Combat Command B, 1st Armored Division, was also involved in this action, taking 202 casualties while destroying 9 tanks and capturing 21 1 enemy. While not a major attack, the action alarmed the Allies because it exposed coordination problems at the critical points where national sectors joined. dissension appeared in the Alliance when the French protested ineffective American support. While Eisenhower struggled to contain squabbles on the Allied side, the Germans refueled their tanks and continued west. On the 14th they hit Sidi Bou Zid, ten miles beyond Faid. With over 200 tanks on both sides, a huge, drawn-out battle appeared in the making. But American armor was spread too thin, and the panzers punched through in only one day. An ineffective counterattack the next day and the stunning capture of some 1,400 troops forced the Americans to undertake a major withdrawal. As the 1st Armored Division fell back, enemy pressure eased. However, on the 16th the panzers resumed their westward push, seizing Sbeitla, twenty-five miles beyond Sidi Bou Zid. Again the Americans scrambled back to establish a new defensive position, this time at Kasserine Pass. Four days of successive defeats cost II Corps dearly. The Americans lost 2,546 missing, 103 tanks, 280 vehicles, 18 field guns, 3 antitank guns, and 1 antiaircraft battery. Even service and medical companies, miles behind the infantry and armor, had been reached by the onrushing panzers. The succession of II Corps defeats did not end with the loss of Sbeitla. Rommel saw the opportunity to keep his battered adversary reeling with a push for an even bigger prize: Kasserine Pass, gateway to Algeria. Adding the 10th and 21st Panzer Divisions to his German-Italian Panzer Army, Rommel struck the II Corps on 19 February. By the next afternoon the pass was in Axis hands. Only the valiant stands of individual battalions and companies on isolated hilltops interrupted Rommel's progress. As an alarming indication of falling morale, American troops abandoned huge stocks of equipment. In a final insult, the disastrous series of defeats was ended not by stiffening American resolve but by a shift in Axis priorities. Concerned that the British Eighth Army might attack from Libya while he was moving west, Rommel turned back to the east. equipment during the February battles, and-in the British view- shown tactical incompetence, the Americans were to play a role auxiliary to the British in the next phase of the campaign. Accordingly, Alexander's staff was primarily British. During late February and early March Allied units in Tunisia increased their combat power. Two fresh British divisions arrived and the British 6th Armoured Division refitted with American Sherman tanks. The French XIX Corps turned in its prewar equipment for the latest American weapons. The U.S. II Corps received the rest of the 1st, 9th, and 34th Infantry Division components from Algeria and replaced lost tanks and equipment as fast as ships, trains, and trucks could bring them to the front. Engineer and other support specialists improved and expanded ports, rail lines, and roads. Best of all for the troops on the ground, Allied air support soon improved. The Mediterranean Air Command under British Air Chief Marshal Sir Arthur Tedder went into operation in late February. Consisting of the U.S. Ninth and Twelfth Air Forces and four major Royal Air Force commands, Mediterranean Air Command could put over the battlefield enough aircraft to challenge seriously the air superiority enjoyed by the Axis thus far in the campaign. commander who would cause his adversaries genuine concern for his willingness to attempt maneuvers others thought rash. With Maj. Gen. Omar N. Bradley as his deputy, Patton set about rebuilding the II Corps into the panzer-killing force he knew it could become. Overlooking no detail-including neckties in the heat of North Africa-Patton pushed his men to fight and dress like the best soldiers in the world. Within days they knew they were led by a commander who would not let them fail. But these preparations did not take place with Axis cooperation. Kesselring kept up the pressure, this time in the north. On 26 February von Arnim launched an offensive against the British in an effort to push his front west to give the Axis a wider secure zone around Tunis. This offensive, which Rommel labeled the brainchild of "nincompoops," failed but served as a painful reminder that Axis units were capable of much hard fighting. Paired with the Axis northern thrust was another in the south. In his last battle in Tunisia, Rommel on 6 March struck the British Eighth Army at Medenine soon after its arrival from Libya. The British blunted the attack and in doing so may have found the tactic that could stop the panzers: massed artillery and antitank fire combined with air raids. 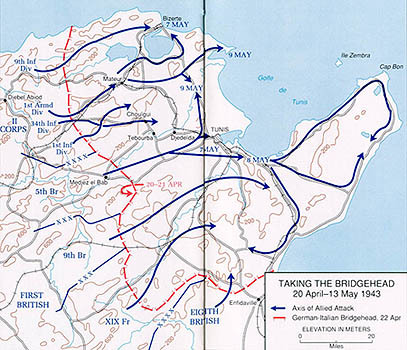 In mid-March the Allies went back on the offensive. General Sir Bernard L. Montgomery's Eighth Army hit the Axis southern flank around Mareth with a multi-division force. In a month-long series of battles, the British, hampered by heavy rains but assisted by worsening German-Italian relations, pushed Axis units over 150 miles north to Enfidaville, only 47 miles from Tunis. Montgomery faced in his push north. The objective for II Corps was a string of towns and hill masses beginning at Gafsa, 180 miles south of Tunis and 105 miles northwest of Mareth, where the British Eighth Army was pounding Rommel's line. Spearheaded by Maj. Gen. Orlando Ward's 1st Armored Division, Patton's men took Gafsa on 17 March but were denied the satisfaction of victory when the enemy withdrew without a fight. Urging on his tankers and their attached 60th Regimental Combat Team, Patton was soon raging at the enemy's alliance with "General Mud"; heavy rains stopped his tanks and trucks for two days. Finally, on 21 March, the Americans covered the 28-mile distance to Sened and took their second objective, this time against light opposition. Again in high gear, Ward's tankers pushed on 20 miles to Maknassy, only to see enemy troops evacuate the village. Continuing east, Ward soon found determined opposition in hills around the village and stopped his column on 22 March to await stronger support. While the tankers rushed eastward' the infantrymen found themselves in a major battle forty miles back to the west at El Guettar. As Allied planners hoped, Kesselring had released the 10th Panzer Division for a counterattack on II Corps. While the German attack pleased strategists waiting for an enemy diversion from the south, the troops of Maj. Gen. Terry Allen's 1st Infantry Division who had to face it saw nothing to celebrate. Over three days from 21 March Allen's men turned back two strong attacks. In fighting that often came down to the "him-or-me" terror of hand-to-hand combat, 1st Division troops pushed the Germans out of their fighting positions and off hilltops. Fortunately, Allen's men could call on strong air and artillery support. Massed artillery and tank destroyers knocked out nearly thirty enemy tanks while mines stopped eight more. American casualties were heavy but the 10th Panzer Division had to withdraw. divisions were exhausting themselves in futile attacks against enemy units dug into rock-face positions with interlocking fields of fire. In nine days the 9th Infantry Division alone lost 120 killed, including 5 battalion commanders, 872 wounded, and 820 missing, injured, or ill. Frustrated at the pace of the American infantry attack, General Alexander directed Patton to send an armored column on a quick thrust to Gabes, the seaport whose possession would complete the division of Axis forces. Patton sent; task force ahead at noon on 30 March, but in three days it made little progress and lost thirteen tanks. The task force was halted, and the emphasis returned to the infantry struggling in the hills. More than a tough Axis defense was stalling II Corps. During the advance from Gafsa to Maknassy, Alexander had told Patton not only what to do but how to do it and then changed the American mission several times. Now in the attempt to advance beyond Maknassy, Alexander again gave orders Patton considered overly detailed and, again, changed them to produce the infantry-first, armor- first, infantry- first sequence the troops found confusing and exhausting. An exasperated Patton, prevented by Eisenhower from saying anything that might upset Allied harmony, complained bitterly in letters to General Marshall in Washington. N. Harmon to lead 1st Armored Division from 5 April. The very next day the enemy made the work of the II Corps easier by withdrawing. With Montgomery breaking through the Mareth Line and Patton pressing in from the west, the Axis began to feel the Allied pincers close. 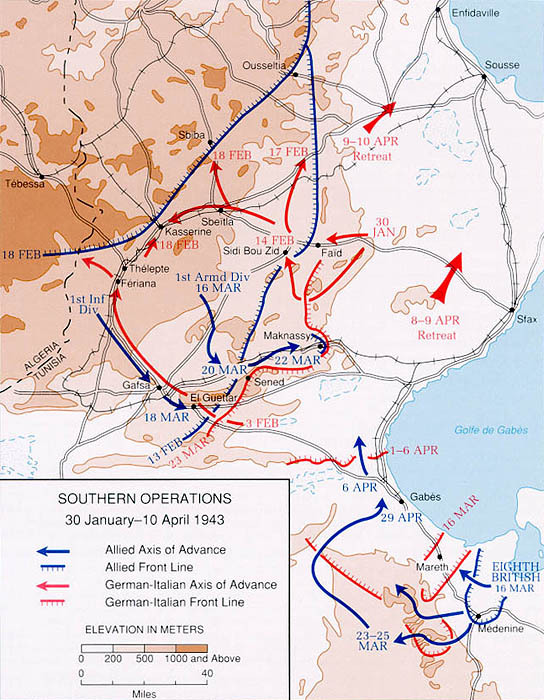 As German and Italian units scrambled to avoid the trap, American divisions began shifting north to apply pressure closer to Tunis. body had escaped the trap. Worst of all for the Allies, the botched attacks touched off arguments in headquarters tents which were contained only by the most pointed intervention of Eisenhower and Alexander. By mid-April Axis forces had been pushed into a perimeter at the northeast corner of Tunisia, an area about the same size as their bridgehead of six months before. The initiative in North Africa had clearly swung toward the Allies. While Allied forces had gained experience and strength over the last six months, Axis units had been increasingly hampered by growing Allied air and naval raids on their supply line from Sicily, with supplies reaching North Africa falling below the minimum needed to sustain operations. But much hard fighting remained before the Allies could stage a victory parade, and several American units had to show marked improvement before they could claim a measure of the credit. General Alexander laid out several missions for the next phase of the campaign: tighten the enemy perimeter, split the Tunis and Bizerte objective areas, seal off the Cap Bon peninsula, and take Tunis first and then Bizerte. The American role in these plans would be to assist the British First Army in pushing back the enemy perimeter and later to take Bizerte. To carry out its missions the II Corps would have the same three infantry and one armored divisions plus three battalions of the French Corps d'Afrique. 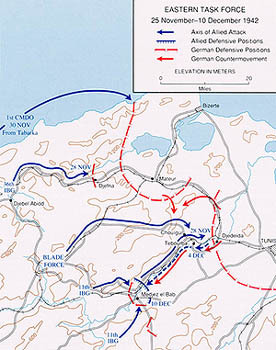 During 14-18 April these units repositioned to the northernmost Allied sector, from the sea about thirty-seven miles inland and thirty miles west of Bizerte. 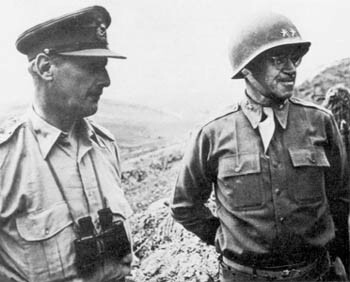 On 15 April General Bradley took command of the II Corps, allowing Patton to begin planning the invasion of Sicily. 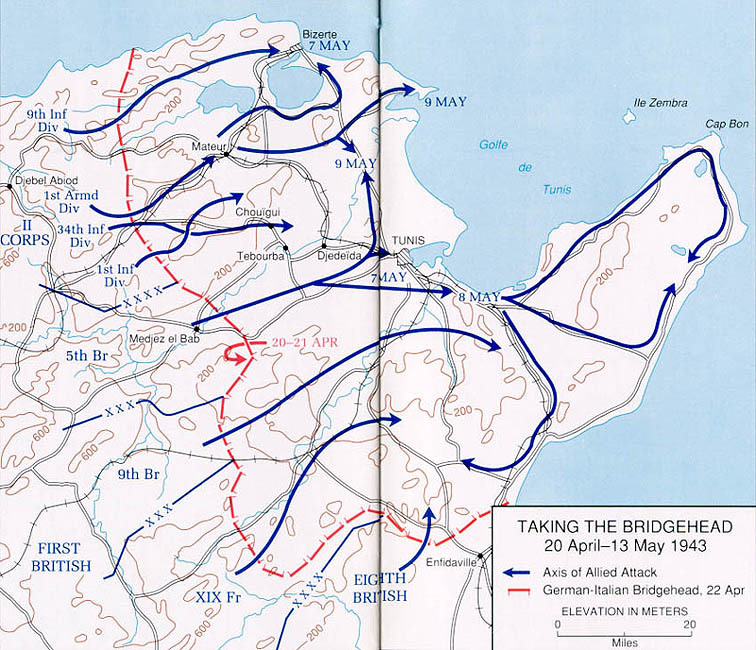 With the Allies still preparing their next move, the Germans tested the British V Corps in a strong attack by the Hermann Goering Division the night of 20-21 April. Though enemy forces penetrated five miles at some points, they could not force a withdrawal and returned to their lines with British tanks in pursuit. On the 22d the British 46th Division struck back at the Hermann Goering Division to open the southwest-to-northeast line of attack General Anderson would take to Tunis, about thirty-five miles away. Losses were high on both sides but the British inched ahead. On the 23d, Bradley launched the American part of 18th Army Group's attack. Both the 9th Division along the coast and the 1st Division to the south found enemy defenses very strong despite American artillery superiority. Progress came in yards, not miles, and some units like the 2d Battalion, 18th Infantry, in the 1st Division area had to retake the same hill three times. Only extraordinary personal courage enabled the II Corps to maintain its advance. Sgt. William L. Nelson gave his 9th Division comrades one such example. From an exposed position Nelson directed mortar fire effective enough to stop a German counterattack, an act which brought down on him a rain of enemy grenades. Though mortally wounded, Nelson crawled to another position and directed more devastating fire on the enemy. For his heroism, Sergeant Nelson was posthumously awarded the Medal of Honor. Convinced of American determination by acts such as Nelson's, enemy units withdrew on 25 April. The next day the 34th Division entered the line between the 1st and 9th Divisions. Under pressure to compensate for its poor performance of eighteen days before, the division mounted a determined assault the night of 26-27 April on a cluster of ridges topped by Hill 609. At the same time, the 1st Division to the south attacked Hill 523. Both divisions were supported by battalions of the 1st Armored Division and by the 27th, 68th, and 91st Field Artillery Battalions. The Americans found desperate defenders and had to take high casualties but steadily gained inches and yards. As happened a few days before in the 9th Division's advance, progress often came only after the most extreme demonstrations of personal courage. On the 28th the 6th Armored Infantry Regiment was pinned down by German machine guns. Rather than await support, Pvt. Nicholas Minue crawled through the enemy line and-using only a bayonet-cleared several machinegun positions before he was killed. For his heroism Minue was posthumously awarded the Medal of Honor. After nearly three days of continuous combat the II Corps had its immediate objectives surrounded but at high cost, particularly in the southern part of the line. Allen's and Ryder's divisions had lost 183 killed, 1,594 wounded, and 676 captured or missing. But with captured German and Italian troops reporting rations and ammunition low, General Bradley believed the enemy was near the breaking point. He quickly reinforced and reorganized his corps to present a four-division front of, from north to south, the 9th, 1st Armored, 1st, and 34th Divisions. On the morning of 30 May II Corps kicked off a general offensive that set in motion an Axis collapse in the north. When American troops overran Hills 609 and 523, 1st Armored Division tanks roared eastward. After nightfall 1 May the Germans again withdrew, this time into Mateur. But two days later General Harmon's tankers drove the enemy out of the town. The Americans had won an important urban center and one only twenty miles from their ultimate objective, Bizerte. The final American offensive of the campaign began 6 May. 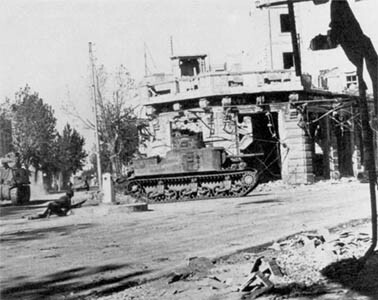 The 1st Armored and 9th Infantry Divisions coordinated an envelopment of Bizerte and the next day pushed retreating enemy into and through the city. At nearly the same time the British V Corps entered Tunis. 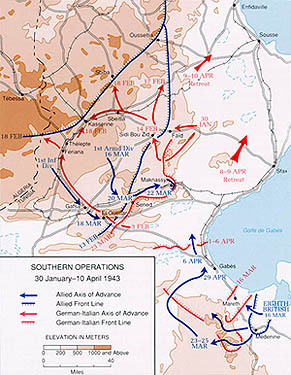 In the southern half of the American sector the 1st Infantry Division found strong opposition but maintained pressure to prevent the enemy from reinforcing other areas. Next to the British sector, the 34th Infantry Division proved it had overcome its tactical inexperience by taking a key pass on the road to Tunis. As II Corps units pushed on to cut the Bizerte-Tunis road, they found Axis units in a state of collapse. Enemy troops were surrendering in such large numbers that they clogged roads, impeding further advance. In the second week of May enemy prisoners totaled over 275,000. When Axis generals began surrendering on 9 May the six-month Tunisia Campaign entered its final days. As General Bradley turned his attention from fighting a determined enemy to governing large numbers of civilians and prisoners, his troops composed doggerel about a memorable lady they had discovered: "Dirty Gerty from Bizerte." If American commanders and troops thought their brief combat experience in French Morocco and Algeria in November 1942 was adequate preparation to face hardened Axis units in a lengthy campaign, the fighting in Tunisia brought about a harsh reappraisal. With few exceptions, French units in North Africa had been more intent on upholding national honor than inflicting casualties and damage; those that offered determined resistance were at a marked disadvantage in terms of weapons, equipment, supplies, and numbers. In Tunisia, however, American soldiers found themselves faced with well-trained, battle-tested units skillfully using the most advanced weapons and innovative combined arms tactics repeatedly to frustrate Allied plans. The result was painful to Army units involved and a shock to the American public: five months of almost continuous setbacks with commensurably high casualties. The fighting in Tunisia underlined both the strengths and weaknesses of the Western Alliance and the United States Army. On the political level the successful conclusion of the Tunisia Campaign left one Allied problem unsolved: factionalism among the French. Followers of Generals de Gaulle and Giraud were still unable to unite in a common cause. In the victory parade in Tunis on 20 May Gaullist troops refused to march with those loyal to Giraud. Until some basis for political cooperation was found, the French would likely remain unable to make more of a military contribution to Allied operations than their two-division XIX Corps. But that was perhaps not so bleak a prospect when considered against enemy losses in Tunisia: nearly 200,000 battle casualties (an entire field army), 275,000 prisoners of war, tons of equipment and supplies, and the mortal wounding of Italy as an Axis partner. On the tactical level the Allies were slow to amass the naval and air forces necessary to stop the flow of Axis supplies from Sicily. Not until the last month of the campaign did the Allies push enemy supply levels below the minimum tonnages Kesselring needed to continue offensive operations. Of more immediate concern to Allied ground commanders, theater-level air forces were unable to neutralize enemy airfields on Sicily despite frequent attacks. In addition, enemy airfields in Tunisia, even those outside the Tunis bridgehead, remained operational well into April. commanders. After nearly six months of working together in the field, British headquarters officers and their II Corps counterparts found a new area of dispute in their respective missions. American commanders were unhappy with the abrupt mission changes ordered by British commanders, and the latter became at least temporarily disillusioned with American tactical capabilities. In order for the American-British partnership to remain functional, headquarters staffs of the two allies would have to do a better job of assigning missions and managing accomplishment, and American units would have to give better accounts of themselves tactically, a problem which they recognized openly and had begun to solve in the latter stages of the campaign. At the beginning of the Tunisian battle the United States Army had in the Mediterranean Theater of Operations parts of four divisions which had acquired only limited experience at a cost of very light casualties in only four days of combat. The remainder of the force was completely "green." At the end of the battle the Army had five full divisions in the field, four of which had gained extensive experience although the cost had been high. American divisions carried out major and minor missions during the campaign in a generally successful manner, but notable failures occurred at Kasserine Pass and Fondouk el Aouareb. After these battles, they were given supporting roles to gain experience. Although American commanders chafed under this British-inspired practice, it allowed the divisions to recover from each setback, and all showed later improvement. Particularly satisfying to Eisenhower and Bradley, the 34th Infantry Division began showing commendable tactical maturity in the final weeks of the campaign. Despite casualty levels that would enervate a green unit, the 34th skillfully coordinated air and artillery support to enhance the effectiveness of its infantry-armor team advancing along the II Corps southern flank. the artillery fire. In other instances, artillery stopped too soon after the seizure of objectives, inviting successful enemy counterattacks. In Tunisia American commanders showed a preference to begin attacks in the last hour of darkness, a tactic which gave the infantry an advantage but created problems for the artillery. Night movement is more difficult for artillerymen because of their heavier equipment and the time needed to prepare and survey gun positions. To lessen chances of detection, artillerymen also tended to accelerate gun repositioning by sacrificing adequate defensive measures. As a result, enemy counterattacks occasionally captured howitzers before machine guns could be placed to cover approach routes. In their many battles against panzer units, American tankers learned much. Tank doctrine before the Tunisia Campaign called for rapid thrusts deep into enemy territory far in advance of infantry. But the devastating effect of accurate enemy artillery, antitank guns, and Stuka dive bombers forced a reconsideration. Greater success with armor came when panzer tactics were adopted: a deliberate tank-infantry advance preceded by intensive reconnaissance and heavy artillery. In the latter stages of the campaign a formula was laid down: one tank battalion in the attack should have three artillery battalions in support. The greater lesson for armored units in Tunisia was to maintain concentration of tanks. Too often, armored units were dispersed to fill gaps or served as emergency reaction forces. These stopgap missions used the mobility of armor but ignored the greater advantages of its shock effect and massed firepower. When the 2d Armored Division operated as a unit in the battles for Mateur and Bizerte, the spearhead potential of armor was at last realized, and the enemy had to deal with sudden breaches in defensive lines, disruption of command links, and chaos in supply dumps. Best of all, American casualties fell dramatically. The mission of tank destroyers (self-propelled antitank vehicles) was clarified somewhat in Tunisia. Battle experience confirmed the fear of tank destroyer crews: their thin armor made them easy targets for enemy tank and antitank gunners in open terrain. They were most effective in an ambush role, digging into a "hull down" position and awaiting a panzer assault. Success in this role, however, depended on accurate intelligence about enemy routes of approach. Over the course of the campaign tank destroyers expended more ammunition in the traditional artillery support mission than in any other role. theater to support all combat units but the system of requesting air support was cumbersome as well, with ground commanders having to go through several echelons of control. Tactical commanders pressed for the assignment of specific squadrons to specific regiments or divisions, but air commanders successfully argued against this policy as wasteful of air resources. The results on the ground were too often confusion and higher casualties. Air support had to be scheduled hours or days in advance and on a few occasions was postponed or canceled altogether, as the 34th Division found at Fondouk el Aouareb on 8 April. When air strikes did occur they were of limited duration, so that if the infantry and armor achieved a breakthrough, aircraft were often no longer overhead when the opportunity for exploitation developed. Only in the last stage of the campaign did air support take forms satisfactory to ground commanders: interdiction attacks on enemy assembly areas and routes of approach. Solution of the air support problem would have to await increased aircraft availability. With victory in Tunisia, the Allies had expelled Axis forces from North Africa and thereby taken a giant step toward victory in the Mediterranean Theater of Operations. The United States Army had contributed mightily toward that accomplishment. The victory in northwest Africa, however, did not come cheaply. Of 70,000 Allied casualties, the United States Army lost 2,715 dead, 8,978 wounded' and 6,528 missing. At the same time, however, the Army gained thousands of seasoned officers, noncommissioned officers, and troops whose experience would prove decisive in subsequent campaigns. These seasoned soldiers of all ranks would not have long to wait or far to go, for the next test was only two months and 150 miles away: the island of Sicily. 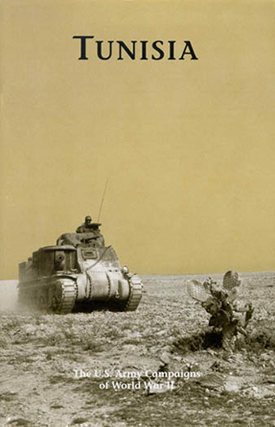 Readings on the Tunisia Campaign are to be found in both broader studies of Operation TORCH and the European Theater of Operations, as well as in autobiographical accounts by key participants and analyses of the battle for Kasserine Pass. General Eisenhower recounts the challenges of international command in his Crusade in Europe (1948). Harry C. Butcher, a naval officer on Eisenhower's staff, gives another view from headquarters in his My Three Years with Eisenhower (1946). The views of armor commanders are to be found in George S. Patton, Jr., War As I Knew It (1947), and Ernest N. Harmon, Combat Commander: Autobiography of a Soldier (1970). Brief but professional treatment of an American setback in North Africa is Martin Blumenson, "Kasserine Pass, 30 January-22 February 1943," chapter 8 of Charles E. Heller and William A. Stofft, eds., America s First Battles, 1776-1965 (1986). The most exhaustive treatment of the battle for Tunisia remains George F. Howe, Northwest Africa: Seizing the Initiative in the West (1957), a volume in the series United States Army in World War II. Cover: General Grant Medium Tank M3 in the Kasserine Pass area.